The Sequoyah County Sheriff’s Office is asking for the public’s help to identify a person that is believed to be involved in a recent auto theft and credit card fraud. Deputies took an initial report of a vehicle being stolen from an area near Roland. A short time later the vehicle was recovered in Ft. Smith. Several items had been taken from the car, including a purse belonging to the vehicle owner. 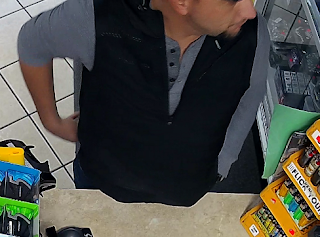 As the investigation continued, the victim reported that his/her credit cards were being used in the Springdale, Arkansas area. The above photos are of the person using the stolen credit cards. 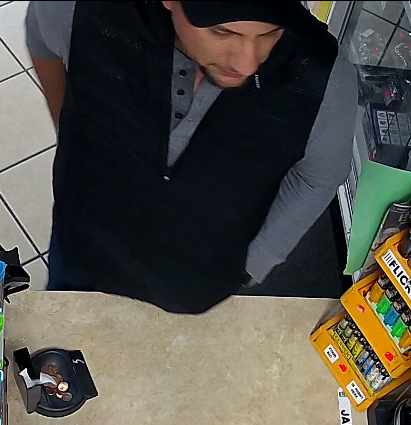 Anyone with information regarding the identity of the male in the photos or the incident is asked to contact the Sequoyah County Sheriff’s Office Criminal Investigations Division at 918-775-1213 and ask for Investigator Gene Wheat. 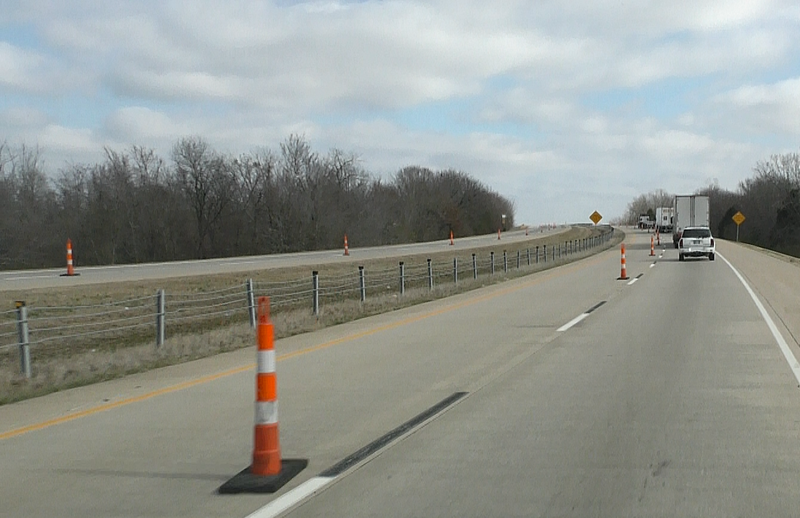 The left lanes of east and westbound I-40 are closed until further notice at the US-64 junction in Sallisaw as part of an interchange improvement project. Delays can be expected, and drivers should plan ahead for extra travel time in this corridor. The $42 million project began Jan. 21 and will replace or rehabilitate ten bridges on I-40 from the US-64 interchange to just east of the US-59 junction (between MM308-311). Pavement will also be replaced in this nearly three-mile area, and ramps will be widened to improve merging points at the I-40/US-64 interchange. Drivers will need to use caution and expect slower traffic and delays, especially during peak travel times. The overall project is expected to complete in early 2021, weather permitting. Candidates for municipal office in Sequoyah County municipalities may file Declarations of Candidacy beginning at 8 a.m. Monday, February 4. Cindy Osborn, Secretary of the County Election Board, said the filing period ends at 5 p.m. Wednesday, February 6. Quinlan Hogan, who authorities had called a "dangerous" suspect was arrested Monday night in Poteau after an all day manhunt involving the U.S. Marshals Task Force. The Sequoyah County Sheriff's Dept. assisted with the arrest. According to Eric Helms, Director of Oklahoma Dist. 27 Drug and Violent Crime Task Force, Quinlan was arrested at the KP's Quick Mart which is across the street from the Leflore County Courthouse. Authorities have been searching for Hogan since Jan. 10 when he led police on a chase that began in Sequoyah County and crossed the Arkansas River into both Leflore and Haskell County. During the chase Hogan ran through two roadblocks, reached speeds in excess of 100 mph and eventually abandoned his vehicle and fled on foot. He was originally wanted on a misdemeanor warrant for threatening acts of violence and also has a previous criminal history of illegal drugs, possession of firearms, and a suspended license. Hogan eluded authorities for 18 days before his arrest in Poteau. If you are looking for a different way to treat your sweetheart this year for Valentine’s Day, you can help one local organization at the same time. The Old Sallisaw High School Association will host a Valentine’s Day Fish Fry from 11 a.m. to 2 p.m. Feb. 14 at the Black Diamond Event Center, 220 W. Creek. Gary Jackson and Crystal Hardy said volunteers will be preparing fried fish, coleslaw, beans, cornbread, dessert and drink, all for only $7 per plate. This is the second year for the fundraiser, according to Jackson. “Last year, we sold out in 30 minutes,” Jackson said, crediting the pre-orders and assistance from the American Legion for the success of the event. Organizers want to make certain they have enough fish this year, so they are asking businesses and individuals to call in pre-orders by Feb. 7, Martin said. Jackson said the proceeds will be able to help the OSHSA maintain the Old Sallisaw High School Park, the rotunda and the event center, which is available for event rentals. “We are blessed by whatever we make on these events,” Jackson said. Guests will be able to dine-in, carry-out or delivery. Call pre-orders to 918-774-3887 or 918-774-2439 by Feb. 7; orders will also be taken on the organization’s Facebook page, Old Sallisaw High School Park and OSHSA Black Diamond Event Center. Carl Albert State College will be holding a free screening of WE ARE STRONGER for all local first responders, their families, and the surrounding community. The movie will begin at 4 p.m. on February 17 in the Hamilton Auditorium on the main Poteau campus. The film is brought to CASC by Harvest Time of Ft. Smith, AR and James Lowe, current Poteau Police Officer and former CASC Campus Police Officer. 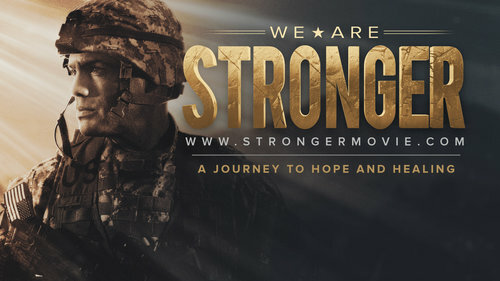 WE ARE STRONGER is a faith-based film that explores a veteran’s battle with PTSD. In WE ARE STRONGER Vic struggles to recover from his physical injuries, reclaim his marriage, and adjust to life after combat, and he discovers he can’t do it alone. 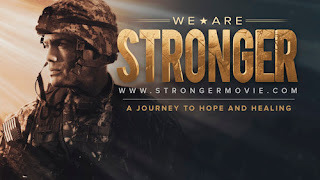 WE ARE STRONGER captures a soldier’s journey to find true healing in Christ. Traditional Cherokee White Eagle corn seeds and Jewel gourds. the Chamber Member of the Month Award. Rod Brooks, owner of the Mazzio’s Pizza franchise in Sallisaw, was recognized as the Chamber Member of the Month during the January membership meeting of the Sallisaw Chamber of Commerce Wednesday. 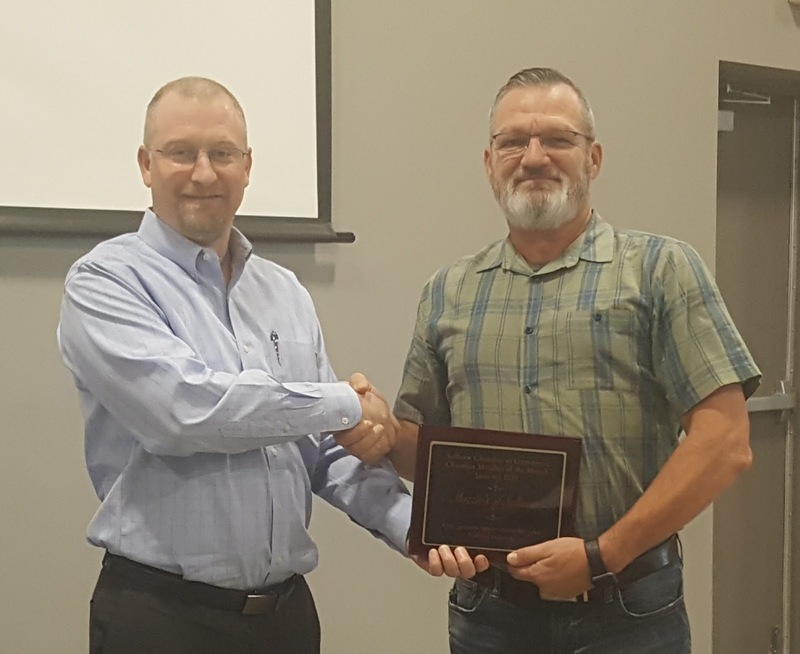 Marley Abell, presiding over his first chamber membership meeting as president, presented the award to Brooks as chamber members dined on a meal catered by Charlie’s Chicken at Indian Capital Technology Center. After his mother’s death in 2008, Brooks became sole owner and attributes the store’s success to the Lord’s blessing and a solid foundation that he and his mom built together into a very supportive community. Brooks said he was honored to receive such a reputable award. In other chamber business, Sallisaw wrestling coach, Darrell Hume, thanked the community for supporting the recent Paul Post Wrestling Tournament hosted by Sallisaw High School, and solicited additional support for upcoming tourneys, which will bring an economic boost to the community from the out-of-town visitors. Hume also mentioned a girl’s wrestling program is set to begin next school year. Brooke Lattimore of the Sallisaw Health and Wellness Center shared information about a free overdose rescue training that the center will host on Feb. 21 for anyone wanting to help save lives in light of the opioid epidemic. Guest speaker Charla Sloan, KiBois Area Transit System director, then shared information about the transportation services KATS has provided since 1998 and continues to provide today. On any given weekday, 19 KATS vehicles are transporting more than 300 riders to either work, dialysis, medical appointments, classes, the grocery store, shopping or other appointments. To close the meeting, Sallisaw City Manager Keith Skelton gave an update on the veterans center relocation to Sallisaw after a Latimer County state representative authored legislation to repeal the laws to close the Talihina center and relocate it. 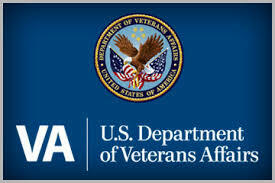 He said his staff is in contact with the Oklahoma Department of Veterans Affairs on a weekly basis. Regarding the bill, Skelton said his contacts say that bill will pretty much be “dead on arrival” and may not even be heard in committee. Ed's Truck Stop located on the east end of Sallisaw near Interstate 40 was engulfed in flames early Friday morning in a fire that appears to have left the building a total loss. The cause of the fire is unknown at this time and the fire marshal will be investigating to determine the cause. No injuries were reported. 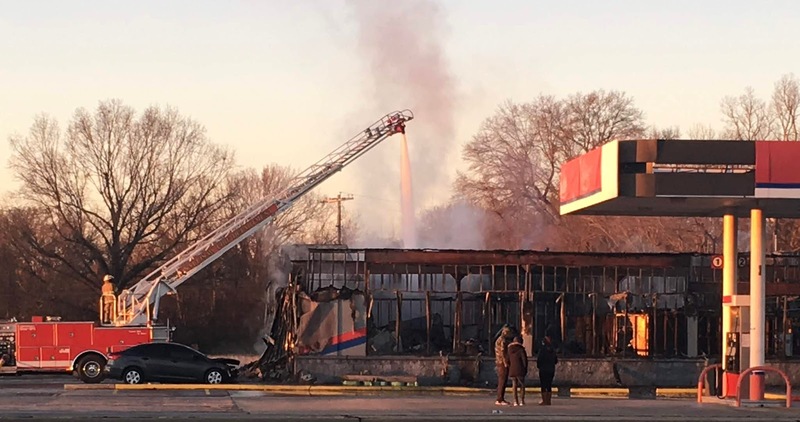 Sallisaw Fire Department along with other volunteer agencies as well as local police and authorities responded to battle the large fire and secure the area. Ed's Truck Stop was home to Ed's Diner, once known as Figtree, which was a local staple and gathering place for many years and originally owned by Sallisaw native Ed Stites. The diner had been the sight of many late night meals after ballgames, rodeos and Sunday after-church buffet lunches. 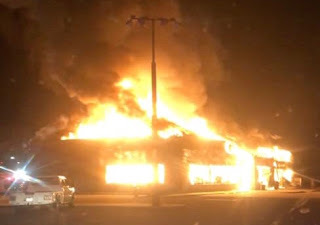 The truck stop and diner suffered from a smaller fire in 1999. The truck stop, while still owned by Stites, was also known for the collection of children's pedal cars that he had displayed along the upper portion of the diner's walls. And you couldn't miss the 1946 Lincoln Contintental Coupe parked inside the truck stop. Firefighters and officials remain on the site at this time (7:38 a.m.) and will continue to monitor and secure the building and surrounding area. 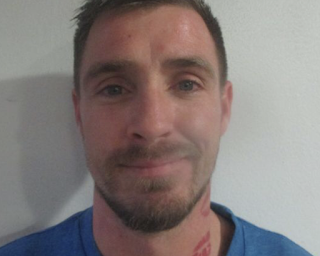 Amos Gary Wright Jr., 36, Vian, was charged on January 16 in Sequoyah County District Court with Count 1: Battery/assault and battery on police officer-felony, Count 2: Escape from arrest or detention-felony, and Count 3: Malicious injury to property under $1,000-misdemeanor. According to the probable cause affidavit, on January 4 deputies with the Sequoyah County Sheriff's Dept. were asked to go to a residence in Vian and perform a home visit on behalf of the Drug Court Office in Sequoyah County. 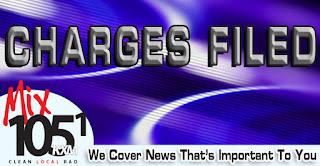 Officers with the drug court believed that Wright was at the residence and in violation of his rules and conditions. A verbal arrest order was given by Judge Kyle Waters if Wright was found to be in violation by associating with Dara Craighead of Vian. When officers arrived at the residence they were informed that Wright was in a camper trailer on the property. Wright responded to the officer's repeated knocking on the door and identified himself. He was instructed to step outside and officers informed him of the reason for their visit. Wright was asked if anyone else was inside the camper and he said no. Wright was then left outside with two deputies while a third went inside. The deputy who went inside reported that he found a female laying on the bed who identified herself as Dara Craighead. The officer then exited the camper and informed Wright he was placing him under arrest. Wright then began to run and ran through a large pool of water into a thick brushy area. He eventually lay on the ground and was placed under arrest. Wright was transported to the Sequoyah County Jail where he was held per Judge Waters order. The charge of escaping apprehension or detention was added. During the pursuit a Kenwood Radio worn by a deputy was damaged causing a charge of destruction of county property to be added. Wright was later released on a $7,500 bond. He is scheduled to appear on Judge Waters felony disposition docket on March 6. Count 1 is punishable by a fine of up to $500 or imprisonment for up to 5 years, or both. Count 2 is punishable by up to 2 years imprisonment/or fine up to $1,000. Count 3 is punishable by a fine of up to $500 or imprisonment in the county jail for up to one year, or both. Local authorities are still awaiting the state medical examiner’s report to confirm the identity of human remains found one month ago in Muldrow. Eric Helms, District 27 Drug and Violent Crimes Task Force director, said the report from the medical examiner’s office has been delayed. 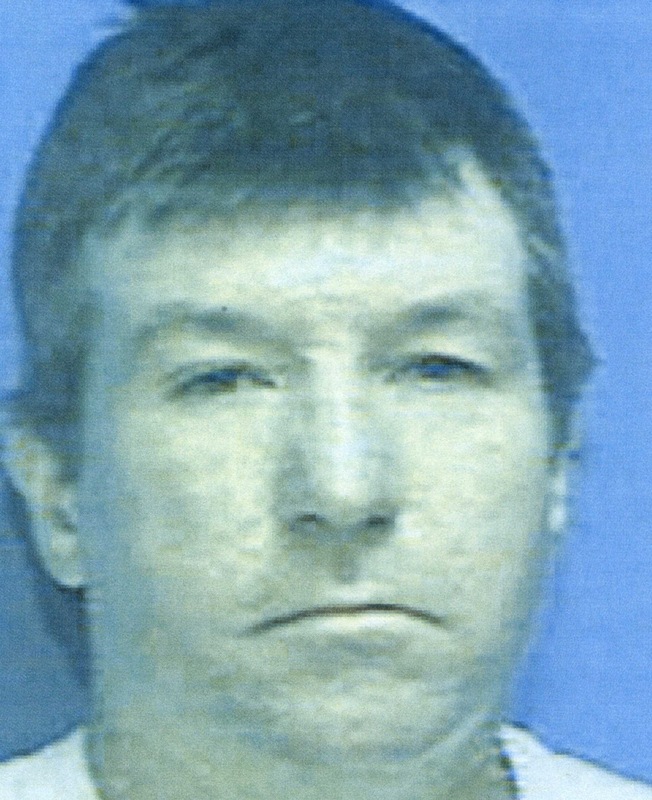 Helms did say authorities believe the remains to be Glen Cook, pictured above, who was reported missing to Fort Smith Police in 2012. Cook, who was 46 at the time and resided in Fort Smith, was believed to have been in the Muldrow area at the time he went missing. Cook’s car, a red Honda, was recovered in the river bottoms area near Muldrow shortly after he went missing. Helms said since DNA obtained from Cook’s sister and daughter years ago was sent to the Arkansas Crime Lab instead of NamUS, a national database, that has caused a delay in identifying the remains as well. “We’re trying to retrieve DNA on that,” he added. Two rabbit hunters discovered human remains in a brush-covered area while hunting near the Wilson Rock area of the Arkansas River south of Muldrow on Christmas Day. According to Sequoyah County Sheriff Larry Lane, the remains are believed to be that of a single individual. Area law enforcement officials continue to search for Quinlan Hogan (above) in the three-county area. Hogan is wanted by Sequoyah County for several warrants, including knowingly concealing stolen property, eluding or attempting to elude police officers, driving under suspension, unauthorized use of a motor vehicle, as well as looting and threatening acts of violence, according to Eric Helms, director of the District 27 Drug and Violent Crimes Task Force. He also has a criminal history of drugs, alcohol and felony firearm possession. Authorities in Leflore and Haskell counties also have warrants for Hogan on additional charges. Hogan led deputies on a high-speed chase Jan. 10 from Sequoyah County across the Arkansas River and into Haskell and Leflore counties. Hogan blew through road blocks in Panama and Spiro before fleeing his Ford Mustang on foot. Helms said law enforcement officials are still searching in the three-county area for Hogan, who they consider "dangerous." He has been spotted near Bokoshe and in Sallisaw. Helms reminds individuals that anyone who has been hiding Hogan will also be arrested for aiding and abetting. If you have any information about Hogan’s whereabouts, contact your local authorities immediately. Cherokee Nation Deputy Chief S. Joe Crittenden honored 13 military veterans with the Medal of Patriotism during the January Tribal Council meeting. Pictured L-R: Cherokee Nation Veterans Center Director Barbara Foreman, Army veteran Noah Welch, Army veteran Everett Sims, Army veteran Raymond Buzzard, Air Force veteran Robert Teague, Army veteran Russell Smith, Army veteran Clifford Bark, Deputy Chief S. Joe Crittenden, Navy veteran Jimmy McGrath, Marine Corps veteran Anthony King, Coast Guard veteran Johnny Kidwell, Navy veteran Jeffrey Conseen, Marine Corps veteran Weston Henson and Navy veteran Ruben Talley. Not Picture: Oklahoma National Guard veteran Terry Thompson. The Cherokee Nation honored 13 military veterans with the tribe’s Medal of Patriotism during the January Tribal Council meeting Monday including three area veterans. The veterans were recognized by Cherokee Nation Deputy Chief S. Joe Crittenden, acknowledging their service and sacrifice to their country. Sgt. Raymond Buzzard, of Marble City served in the Army from 1969-1971. His decorations include the National Defense Service Medal and Expert Rifleman M-16 Badge. Lt. Col. Jimmy McGrath, of Gore served in the U.S. Navy from 1971-79 and the Army from 1982-96 and 2006-09. His decorations include the Bronze Star, Iraqi Campaign Medal and Global War on Terrorism Service Medal. Sgt. Robert Teague, of Tahlequah served in the Air Force from 1973-79. His decorations include the Outstanding Unit Award, Longevity Service Award and Good Conduct Medal. To nominate a veteran who is a Cherokee Nation citizen, please call 918-772-4166. 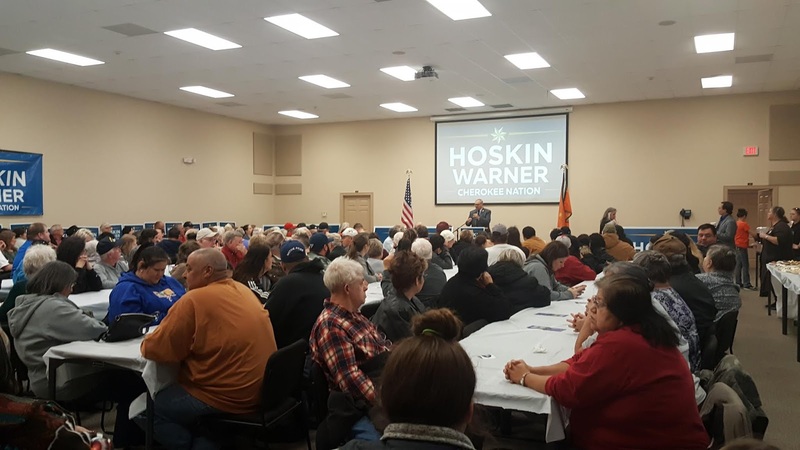 Sallisaw was recently one of the latest stops for the Hoskin-Warner campaign. Several hundred supporters filled the People Inc. conference center on Thursday, Jan. 10, to hear the pair’s vision for the Cherokee Nation. Chuck Hoskin Jr. is running for Principal Chief of the Cherokee Nation and Bryan Warner is running for Deputy Principal Chief. Hoskin said he feels he and Warner will make a great team leading the Cherokee Nation. “We’re just very excited about where Cherokee Nation is right now; we’re in a position of strength,” said Hoskin, who currently serves as the Secretary of State for the Cherokee Nation. “We can keep building this region up. 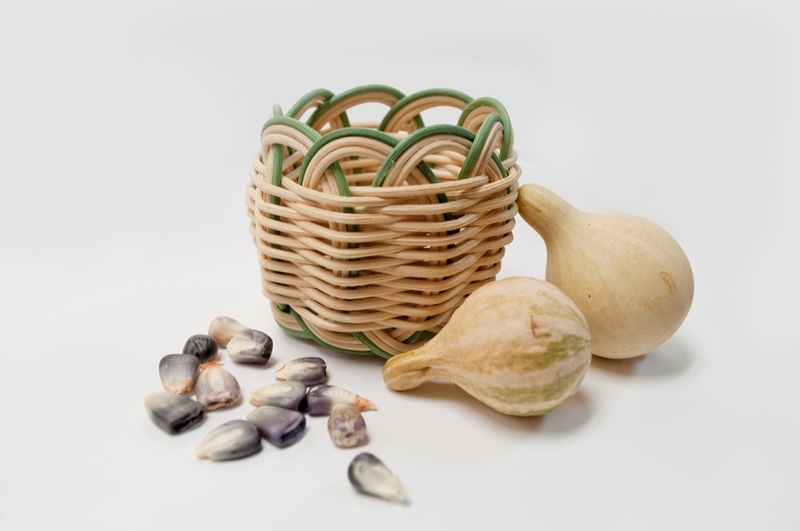 We can keep making the dreams of the Cherokee people possible. We just have to keep doing it. I’ve got the background. I’ve got the skills. I’ve got the experience to make that happen. “With Councilman Bryan Warner, he adds so much to what we’re doing,” added Hoskin, who lives in Vinita. Warner said the pair have discussed at length things they want to accomplish for the tribe. Current Principal Chief Bill John Baker spoke during the rally, offering his support for the pair of candidates. Baker will not seek re-election due to term limits. Also speaking at the rally was District 6 State Rep. Chuck Hoskin, a former Cherokee tribal councilor currently serving as Baker’s Chief of Staff and father of Chuck Hoskin Jr. The general election is set for June 1. A Latimer County state representative has filed legislation intended to stop the transfer of an Oklahoma Veterans Center from Talihina to Sallisaw. State Rep. Jim Grego said House Bill 1149 would eliminate the authorization to transfer the center that was first granted by legislation passed in 2017 and signed into law by former Gov. Mary Fallin. “There is no reason the Oklahoma Department of Veterans Affairs can’t update this existing facility to better accommodate the needs of its residents,” said Grego, R-Wilburton. It was announced last fall the Oklahoma Veterans Commission and the Oklahoma Department of Veterans Affairs would move the 175-bed, long-term veterans care center from the aging Talihina facility to a new $100 million center in Sallisaw within the next three to five years. The center employees about 275 people. Sallisaw City Manager Keith Skelton said progress is still moving forward with Sallisaw officials for the relocation. Skelton said Sallisaw submitted proposals like many other communities did; however, the Sallisaw proposal included moving considerations for center employees, as well as other property incentives and contributions from a number of Sallisaw businesses and organizations in a unified collaboration with the city. Officials are excited about moving forward with the relocation of the veterans center to Sallisaw, keeping in mind the best interests of the veterans and their families. It’s been over three decades since Sallisaw has presented a Key to the City. But it happened this week as community leader Buddy Spencer received the prestigious honor. Mayor Ernie Martens presented Spencer with the key to the city during the monthly city commissioner meeting Monday, Jan. 21, as a token of appreciation for all he has done for the community of Sallisaw. 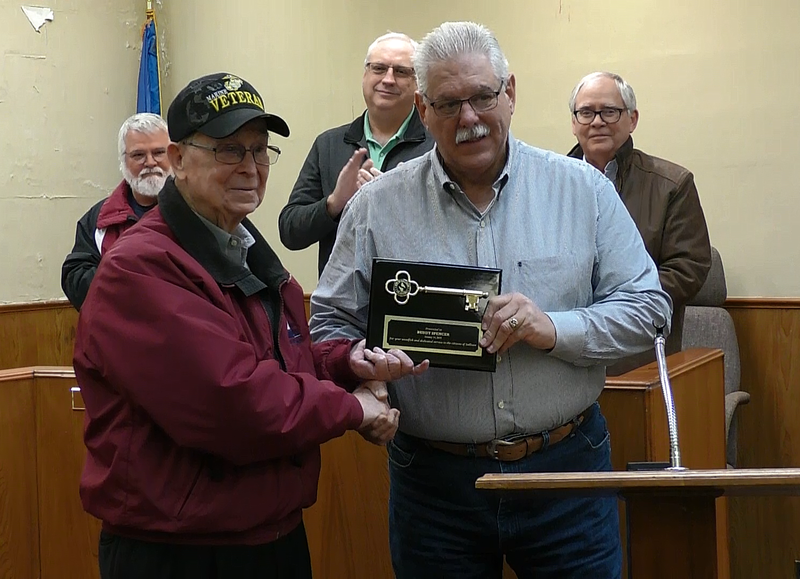 Sallisaw City Manager Keith Skelton said the presentation of the key, along with a bronze commemorative city coin, was meant to recognize Spencer’s contributions to Sallisaw. “Buddy has done a lot for our community since he’s been here,” Skelton said. “It just comes down to thinking about all he’s done for our community – and it’s been so much. Spencer remains an active member of the Sallisaw community and is well known for his love of public service. Skelton said he continues to support Sallisaw’s economic development and education in the community. With a long and very successful career in the automobile business spanning more than 50 years, Spencer has owned and operated over 10 dealerships in three states. He owned Buddy Spencer Ford in Durant, his first dealership, before later moving to Sallisaw in September 1995. The Spencer family currently owns and operates Blue Ribbon Auto Group in Sallisaw. With a passion to serve his community, Spencer has served as president of the Chambers of Commerce in both Durant and Sallisaw. He was appointed by Gov. George Nigh to the Executive Committee to study reform in state government. He currently serves as president of the Sallisaw Improvement Corporation, where he has been a tireless proponent for expanding the city’s industrial park, especially companies such as Aviagen. Spencer has also lived a life dedicated to his passion for public education. He has served as a school board member and also as president of the Oklahoma State School Board Association. The Oklahoma School Board Association annually presents the Buddy Spencer Leadership Award in Oklahoma City. He was instrumental in the marketing for the new middle school construction in Sallisaw. Spencer was selected as the Distinguished Alumnus at Southwestern Oklahoma State University in 1983, a recipient of the Oklahoma Education Association Award for Excellence in Education, and a 2014 honoree of the State Regents of Higher Education Business Partnership Excellence Award. Instrumental in bringing the Carl Albert State College campus to Sallisaw, he continues to support business growth and Spencer currently serves as a trustee for the CASC Foundation and is chairman of the Committee for Excellence in Sallisaw where they raise scholarship money for graduating seniors in Sequoyah County. With Spencer's leadership, the committee has raised over $600,000 for the students. He is also a member of the Carl Albert State College "Hall of Fame."